He has been away from the bench for three years on a self-imposed sabbatical. But as Hockey News North was first to report in an earlier story, long-time Sault Ste. Marie coach Patrick Carricato is returning to the game with the major midget Soo Indians alongside general manager Mike (Zeke) Kaunisto. In fact, it is a return engagement for the 47-year old Carricato to re-join Kaunisto and the Indians. Carricato had previously coached the Indians under Kaunisto for a couple of winters of Michigan Amateur Hockey Association play before opting to take a break from the game. And having been on a hockey hiatus for the past three seasons, Carricato is looking forward to being a coach again. He said he began to realize how much he missed the sport that he grew up around as a youngster in the gritty west end of Sault Ste. Marie, Ontario. Then, a few weeks back, with the Indians looking to replace outgoing head coach Sean Tallaire, Carricato said he heard from Kaunisto, the Michigan Soo’s team’s veteran GM. “So, when Mike called and came to see me and we talked about coaching again, I started to get excited again,” Carricato relayed. “Mike and his staff have being working really hard on recruiting since the (2018-2019) season ended and planning on wanting to be more competitive. “So for me, that was a big selling point … seeing their commitment,” Carricato continued. The Indians finished with an overall record of 11-38-9 through 58 games in 2018-2019 and Kaunisto, as the GM, wants to see the Michigan Soo squad be more of a factor moving forward. 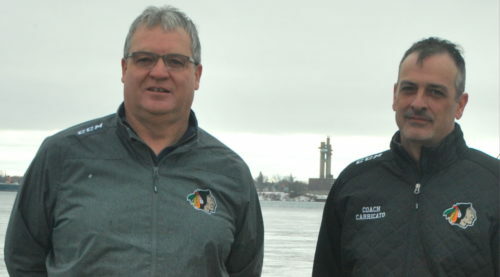 “Pat’s a really good coach who knows the game and who gets a lot out of his players,” Kaunisto said of Carricato, who, before his prior gig with the major midget Indians, coached the Soo Thunderbirds of the Northern Ontario Jr. Hockey League for a number of years. Kaunisto took further note of Carricato’s experience and expertise. Meanwhile, Carricato said the competitive fires are burning within him again. “I am excited to get back on the ice and start teaching again and working with a great bunch of friends in Mike and his staff,” said Carricato, who has many of the old school traits of his dad, legendary Soo hockey coach Abbie Carricato. To be sure, the elder, no-nonsense Carricato holds a high place in Soo hockey history as a coach who spanned decades of service. Besides being the first-ever head coach of the Soo Greyhounds of the Ontario Hockey League, Abbie also coached the Soo Thunderbirds of the erstwhile International Jr. B Hockey League as well as a number of midget teams including the Bay View Athletics, Algoma Contractors and Soo Legion. Back to the Indians, an invitational camp is upcoming according to aforementioned general manager Mike Kaunisto. “For the first time, the Soo Indians will be holding a invite only tryout on May 4 and 5 (in the Michigan Soo) which will have a total of 40 players competing for spots on next season’s team,” Kaunisto confirmed. And there is more ahead for the Indians in advance of the 2019-2020 season. “We will also be playing in a spring showcase in Plymouth, Michigan from May 31 through June 2 … we will be up against Detroit Victory Honda, Detroit Little Caesars and the Cleveland Barons, who are all Tier 1 AAA major midget teams,” Kaunisto told Hockey News North. All the best to Zeke and Patty and of course “Big Daddy”. Great group of guys focused on developing young men into top players with a much better chance of advancing in hockey and life.